All parents want the best for their children and they make it their mission to give their kids the best start to life. But many parents seem to simply regurgitate the same patterns of consumption they inherited from their parents. This can be troubling when it comes to the food that fuels us. Good food is essential for growing bodies, this is why more and more parents are turning to a vegan lifestyle to give their kids a good start. It is the position of the Dietitians of Canada that a well-planned vegan diet is suitable for all stages of life including pregnancy, infancy, childhood, adulthood and old age. Any remaining fear mongering misconceptions around vegan children can be quickly put to rest by healthy vegan families thriving all over the world. Here are a few parents raising healthy vegan children to inspire you to make the switch for your family. Ellen Fisher is raising three healthy vegan children in Hawaii. Elvis, Sandy, and Scout have all been vegan since conception and are full of life, as you can see on their popular YouTube channel. Ellen and actor Alicia Silverstone bonded over their shared vegan lifestyle and these power parents teamed up in a YouTube video to show people just how easy and delicious eating vegan can be. Parents of picky eaters will be shocked to see vegan kids munching on vegetables with no need for bribery. Not only is their food vegan, but a large majority of it is completely raw. For dessert, the pair made their kids a raw vegan sorbet out of bananas and berries, showing that delicious dessert does not have to be deleterious to health. 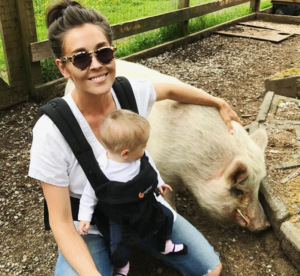 Anna Pippus is not only a mother of two young boys, but she is also the Director of Farmed Animal Advocacy at Animal Justice. Her passion for animal rights spills over from her law career and into her culinary choices for her family. On her Instagram stories, EasyAnimalFree, and her blog, she shares in-depth vegan recipes, going through each step for her followers to show just how easy cooking vegan can be. Her feed is a mouthwatering look at the wide array of meals she serves her family, from Mediterranean white bean soup to Peanut Noodle Stir-Fry each recipe seems to be better than the last. All of her recipes are kid-approved with a strong focus on nutrition for her growing boys. She uses simple ingredients to create quick, no-fuss food for her family. Erin Ireland is the owner of To Die For Fine Foods based in Vancouver. 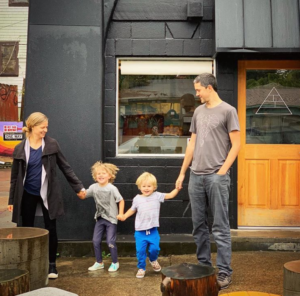 When she is not owning the plant-based business world, she is whipping up nutritious meals for her young vegan family. Unlike most kids, her baby absolutely adores fruits and vegetables. Seeing her thriving vegan baby puts to rest any lingering rumors that veganism is unhealthy and acts as an inspiration for others to raise vegan children. She shares all her recipes on her Instagram stories and website to help others cook simple yet delicious meals for their family. Erin wasn’t always vegan, she speaks in her Ted Talk about at one time promoting meat-heavy dishes in a bid to gain more likes online. But as she came to learn more about the health, environmental and ethical implications of consuming animal products, she started using her influence to promote plant-based eating instead. Vegan families all over the world are proving children can thrive on a plant-based diet. It is essential that there are positive role models for others to follow. By sharing their content online, vegan parents work to normalize a once marginal movement. Not only are they raising well-rounded vegan individuals, but their journey is helping other parents see veganism as a viable lifestyle for their family. It can be hard to make changes, especially ones that are so ingrained like eating habits. But the more information and resources provided to parents, the more informed choices they can make for their children. After all, the habits made in their youth are likely to stick with them for the rest of their lives. This is why it is so essential to teach children to be kind to animals, the Earth and themselves through their relationship with food. As the vegan parenting movement grows, we will be charting the changes and keeping you up to date. Follow us on Instagram and Facebook for more content on the increasing intersection between veganism and parenting.